At Smart Service, we know that a handyman is a superhero. Our handyman software integrates with QuickBooks to provide an easy-to-use billing, invoicing, and scheduling solution! With Smart Service, scheduling technicians, handling customer history, and keeping track of billing history is done on one system. That way you can spend less time worrying about pesky invoices and more time saving the world. As a handyman, you are the Superman of managing your schedule and keeping up with invoices. 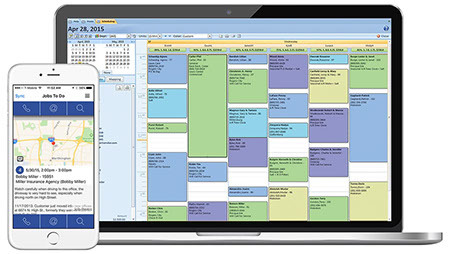 Smart Service handyman software incorporates scheduling with QuickBooks, freeing up your time so you can continue to grow your handyman business. With Smart Service, you can create multifunctional schedules that pair with QuickBooks. Yes, that’s right. Jobs you schedule can create invoices that can load onto QuickBooks. So no more late nights spent trying to locate, copy, and transfer all of your invoices. New jobs can be created for a handyman already in the field. With handyman software for QuickBooks, confusion over schedules is a thing of the past! You’ve spent years building your customer relationships. If you’re worried about all the customer information you’ve already built up on QuickBooks, relax. Take a breather. You can import all existing information from QuickBooks to Smart Service! We know you’ve spent years collecting customer information and storing it on QuickBooks. We also know that you want QuickBooks to function flawlessly with Smart Service. All future information you create on Smart Service can also be imported back to QuickBooks. Cowabunga! Remember those days when your handymen had to carry forms with them while out on the job? Those days are gone! With the Smart Service multifunctional mobile app, all your forms are digitized. This means no more worrying about coffee and food stains on forms. Digital forms allow payments to be swift and easy. Customers can fill out and sign forms on the spot. Smart Service will then generate an invoice that gets sent to the office system. Billing and importing that information to QuickBooks is as easy as 1-2-3! Request a demo today to see how our handyman software for QuickBooks can go above and beyond for you! Check out some of our handy tips for handy professionals!